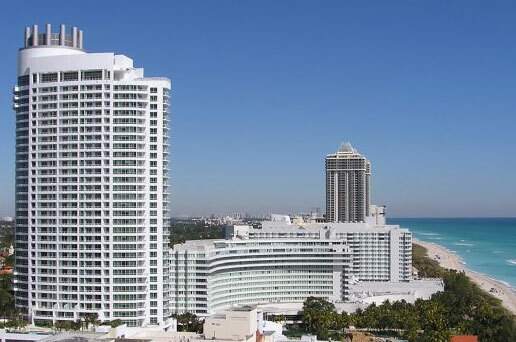 The Fontainebleau is one of the most widely recognized and popular Miami Beach condos for sale in the barrier island. It's developed a sterling reputation as a major city hotspot in addition to offering condominium residences and hotel suites run by the Hilton brand. The Fontainebleau III, also known as the Sorrento building is one of two buildings where you can experience the Miami Beach lifestyle at an optimum level. Fontainebleau is directly on the beach so you won't have to drive anywhere if you want to spend the day just lounging and soaking in the South Florida sunshine. You'll also come across a pair of tennis courts, a spa and fitness facility offering a wide range of classes, lounges, a water playground for families, water sports and much more. Each of the Fontainebleau III units are full furnished and they also come with granite kitchen countertops, marble bathrooms and balconies with views of the ocean, the beach and the Miami Beach cityscape. Pets are also allowed in Fontainebleau. The Fontainebleau itself is packed with a number of activities to enjoy and you'll find an even greater number once you decide to explore Miami Beach. Check out the Art Deco district, shop or dine in Lincoln Road, party on Ocean Drive, visit the museums or head west across Biscayne Bay to Miami's downtown area and watch a game or performance at the American Airlines Arena.